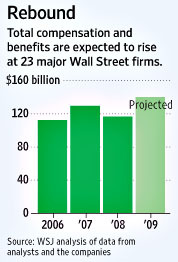 ….Total compensation and benefits at the publicly traded firms analyzed by the Journal are on track to increase 20% from last year’s $117 billion — and to top 2007’s $130 billion payout. This year, employees at the companies will earn an estimated $143,400 on average, up almost $2,000 from 2007 levels. I sort of feel like I’ve run out of things to say about this. There’s an insanity here that’s almost beyond analysis. Wall Street can spark an economic slowdown that misses destroying the planet and causing a second Great Depression only by a hair’s breadth — said hair being an 11th hour emergency infusion of trillions of taxpayer dollars — and then turn around and use those trillions to return to bubble levels of profitability within a year. And they can do it even though the rest of the economy is still suffering through the worst recession since World War II. It’s mind boggling. Is there any silver lining here? Probably not, but I’ll try: If Wall Street can shrug off the worst recession of our lifetimes as if it’s a minor fender bender and get the party rolling all over again in less than 12 months, it means the next bubble is already in the works and its collapse will be every bit as bad as this one. That in turn means it will almost certainly happen while today’s politicians are still in office. So maybe news like this will finally spur lawmakers to realize once and for all that the financial industry needs to be cut down to size. Half measures won’t do it. Self-regulation won’t do it. Compensation limits won’t do it. Byzantine, watered-down rules won’t do it. Something like a Morgenthau Plan for Wall Street is the only thing that has even half a chance of working. Will Congress finally get this? Probably not. The financial lobby is just too strong. But we can hope.